What a day! 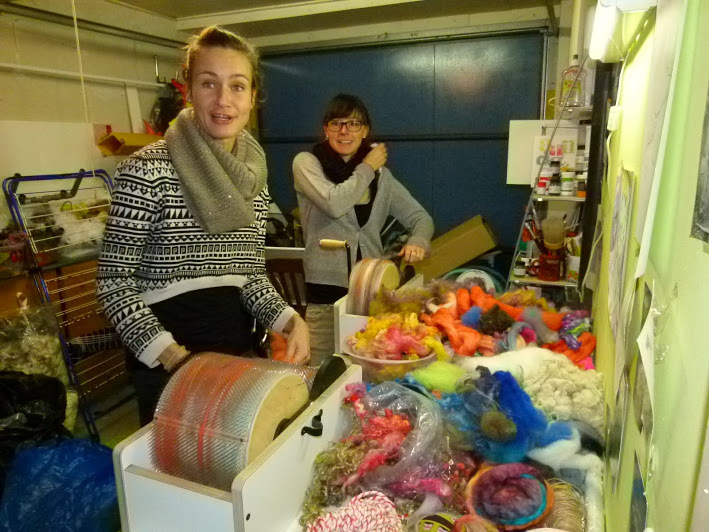 Saturday 8th of December, a thick layer of snow on the ground, a cosy house, a table full of colourful fibers, and a room full of women with wheels! Sounds like the perfect day to me, and it was! It was lovely to finally meet everyone in person, some faces were already very familiar to me from Facebook, and it was great to see things in real life, like Tinekes awesome sparkly bobble hat that she bought along, and the lovely hand dyed fibers that Peti had been preparing before the workshop. We started out talking about what kinds of yarns everyone was interested in making, and it seemed a fairly good consensus that bulky singles were a desirable goal, as well as coils, thick and thin puffy yarn, and core spinning. Its funny how pretty much every spinner starts out making nice big chunky yarns, then we gradually refine our technique, gain control over the fibers and our drafting, and are soon making those lovely fine singles we started out wishing we could do. Then one day we think, I want a bit chunky yarn now, to make something cuddly for winter, and we start spinning, only to find that the fine yarn keeps coming back! Its like our hands and feet are now programmed to make this, and only this, and have totally wiped from memory the chunky yarn skill we started out with! 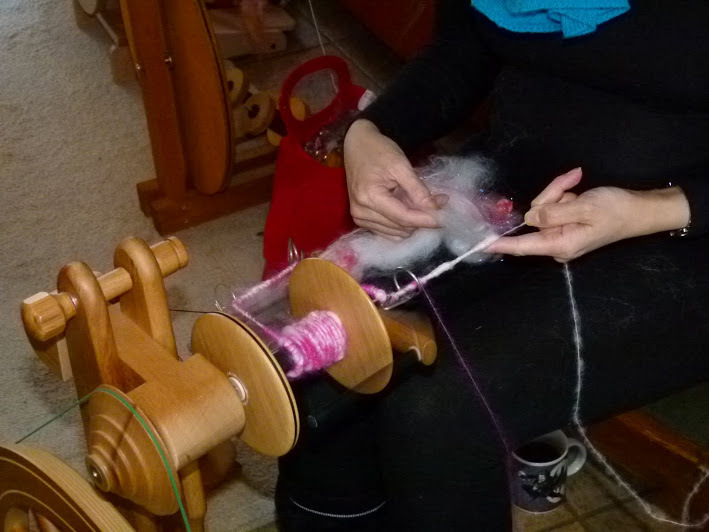 Well during the workshop we did a little bit about this, using a roving (top) to draft nice thick quantities, keeping our hands loose to spin the air into the yarn.. and to follow this up I will also be making a newsletter to send out this week with an extra mini tutorial on spinning bulky yarns. We also looked at corespinning, which can, probably more easily, be spun bulky (as well as fine). Some people were already pretty good at this and others just starting with it. Jennifer had a wonderful blend of angora (from her own rabbits) and silk, which she corespun WITH a lovely pink mohair autowrap, so pretty! Then we also did some thick and thin spinning, its not an easy thing to do, and, at least for me, took a lot of practice to get any good at, so my goal in the workshop was to show the technique, so who ever wanted to could go home and keep working on it to get a nice smooth thick and thin. Thats exactly what Brigitte did! She posted this on her FB page after the workshop! There was also a good amount of carding done! Lisette and Evelien had a fluff party at the drum carders, and then spun up some stunning corespun yarns with the results! Annelies sat so calmly behind her lovely Country Spinner producing a gorgeous range of textured yarns, including a bit of tailspun, some corespun, and some coils! 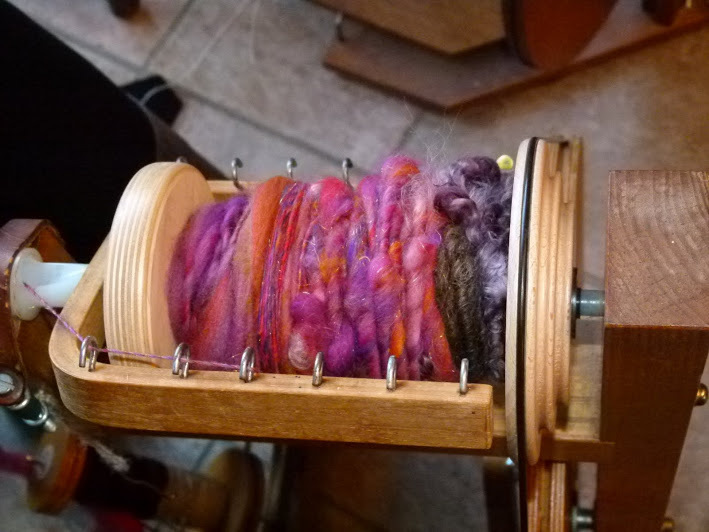 And Hennie had a go at everything, also creating the nice big bulky yarn she had hoped to, some very pretty beehive coils, and Nolleke also made some great coils, leaping ahead on her quest of making something other than the lovely fine singles she had been spinning already. So lovely! This was something I had learned myself not so long ago from Esther Rodgers (Jazzturtle) at the workshop she did here in Holland at last July. Its a lovely technique, easy to do and with such a lovely light and textured result. Overall, I hope everyone had a fun day, learned something new or was helped with something they might have found difficult, that the fibers were enjoyed, and that the food was pleasurable 🙂 I had made a Pumpkin Soup and giant Carrot cake (recipe at the end of the post). Beautiful spinning. I am a beginner and want to do some corespinning. 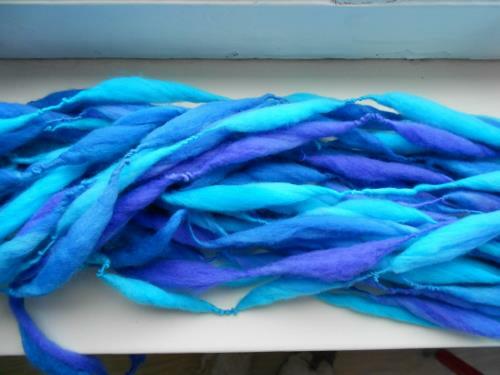 Would like to do a super bulky, what would you recommend that I use for my core yarn? Hi Karen! Thanks for taking the time to read my blog 🙂 I would suggest that for your core yarn you choose something strong, and textured or fluffy, so that it ‘grabs’ your fibers and holds them on the core easily. Be prepared for a bit of frustration at the start as it is highly likely you will start out spinning with a lot more twist than you would want, but with practice this will definitely improve! 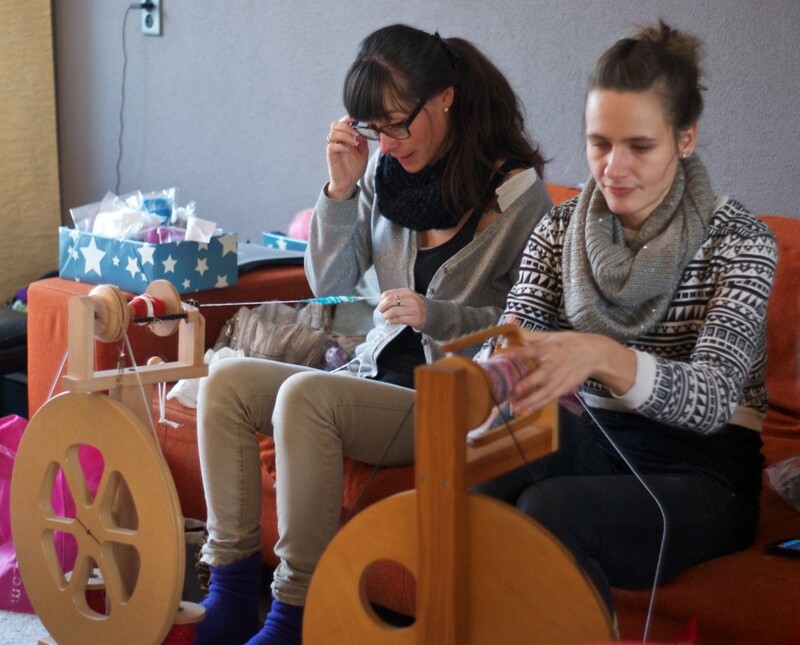 One tip, set your wheel tension up high enough to pull the yarn on quite strongly, and treddle slowly. Good luck! Thank you for your reply. Would commercial sport weight wool work? Which drum carder would you advise? so lovely to see all the spinning of dreams come true . . .
Hi Suzie, just getting round to reading your site …. it was a pleasure to be out and about among fellow artists. Had a great time. Dear woolwench, I have just read through your last 3 months, having discovered your blog a wee while ago, due to my dabbling into art yarns. I’m a dutchie living in NZ, love fibres, do felting, and have been to the Rissington Omatua fibre retreat many times in the past. I adore your l.o.t.r. yarns (and the fun you could have soon with making 13 different dwarf yarns, 1 would have to be pretty chunky!) and found you because of the hobbit feet yarn you had made. 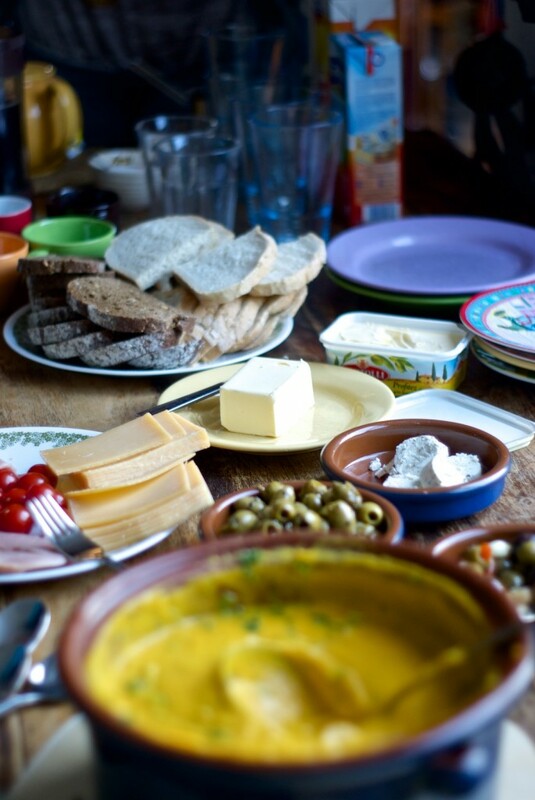 Do people in The Netherlands eat carrot cake often? I had never heard of it when I was there. Hi Ellen! How cool, we have swapped! 😀 Which part of the country are you living in? I grew up in and around Napier Hawkes Bay. Which part of Holland are you from? I don’t actually find much carrot cake here, although a couple of years ago it seemed totally unheard of, now there are a couple of cafe chains that make it, not always to expectation but they are getting better all the time 🙂 I even found a cafe in Amersfoort that makes Flat Whites! That was a blissful discovery 🙂 turns out one of the owners had been in Aus, lucky for me 🙂 I think NZ and NL have quite a few interesting parallels, even though they are generally very different, and one of them is the Louet/Ashford history. I am pleased to be finding more and more spinners here too! Well, actually I live in Napier on the hill. Our big pohutakawa is looking all chrismassy and the weather is around 24’C. But originally I’m a Frisian girl. I remember as a wee girl stripping bits of wool from barbed wire when staying at my Omas’ in Drenthe, and keeping the wool in my pocket to fiddle with. Love of fibre started young! I can’t believe that in a land of coffee addicts, you can’t get a flat white !…What about long blacks? Oooh! Those yarns all look delicious and the last one is sooo pretty and shiny! I wish I could’ve been there, it looks like cosy heaven!! 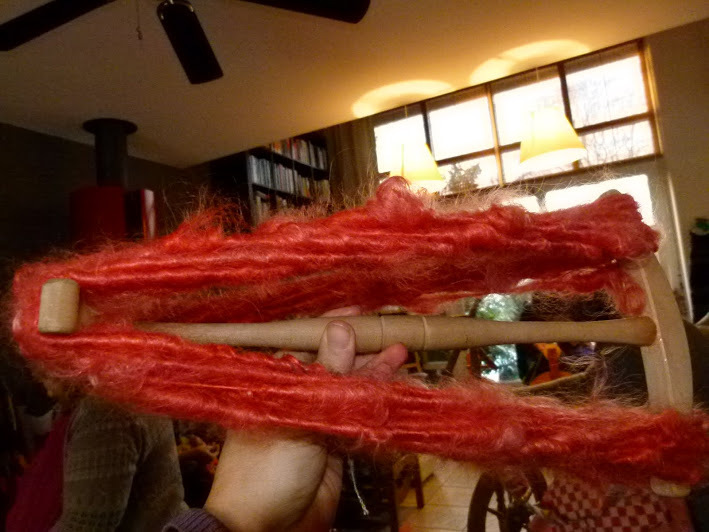 Can’t wait for the spindle spinning workshop!! wow, this all sounds great, I wish i was there with you. And thanks so much for the recipe of the carrot cake, I am surly gone try it. Sounds so wonderful. I love those kinds of days. Spin on ladies.